After fighting in the Battle of Britain, Romania and Crete, JG-52 transferred to the infamous southern sector of the Eastern Front. Though conditions were often appalling, its pilots notched up an incredible 10,000 victories with sixty- seven of them awarded the Knight’s Cross or higher decorations. JG-52’s top ten fighter pilots achieved an astonishing 2286 aerial victories between them and boasted the three highest-scoring Aces in history of which two, Erich Hartmann and Gerhard Barkhorn, were the only Pilots ever to down more than 300 enemy aircraft. 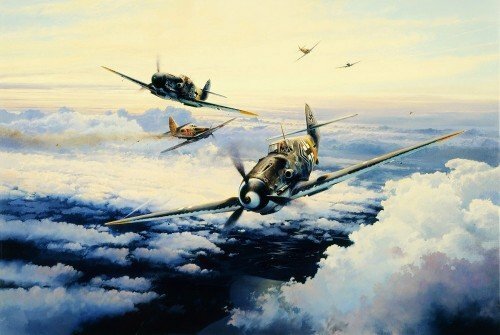 The original lithograph edition, personally autographed by some of the highest scoring Luftwaffe Aces of all time, is long sold out and a prized collectors item only available on the secondary market. However, continuing Robert's popular series of Studio Proofs, the Military Gallery is delighted that this outstanding Masterwork painting is now faithfully replicated on canvas, allowing collectors to acquire one of the most iconic aviation paintings ever created. Printed onto fine canvas under the supervision of the artist, each of these carefully crafted Giclée Studio Proofs are fully authorised and signed by Robert Taylor. Exclusively limited, each canvas is stamped on the back, hand-numbered and issued with a Certificate of Authenticity. Each canvas is released pre-stretched from the Military Gallery ready to simply drop into a frame of your choice.